Made in Japan from quality ceramic, this sake serving set comes with a sake serving jug and four matching sake cups and is perfect for enjoying your favorite sake with friends and loved ones. Glazed to a smooth glossy finish, this lovely sake serving set is in charming shades of beige and red orange and feature the motif of sakura—cherry blossoms in and elegant beige. Light brown speckles add visual texture to the overall design. 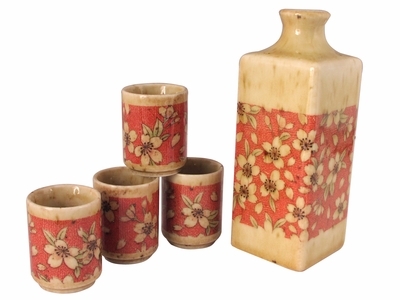 The sake jug in this sake serving set comes in a unique rectangular shape with a round rim designed for serving sake both warmed and chilled however you like your sake. The four sake cups feature matching motifs of sakura blossoms. Elegant and full of the delicate charm of spring, this sake serving set makes a wonderful gift idea for sake lovers. Item comes packaged in a paper gift box. Hand wash is recommended for this item.